SETH GODIN is the author of eighteen international bestsellers—including Purple Cow and Tribes—that have changed the way people think about marketing, leadership, change, and the way ideas spread. He founded Yoyodyne and Squidoo, is a successful (and unsuccessful) entrepreneur, and a very popular lecturer. He publishes inspiration daily on his blog, consistently ranked as one of the one hundred most popular in the world. "This is a book about giving a damn. It’s about caring about what you do and (as important) who you do it for. 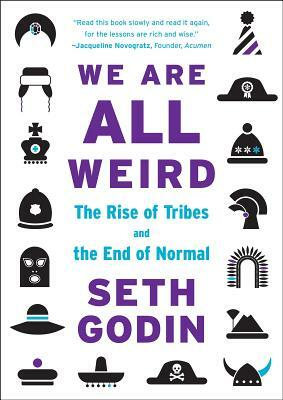 Professional apathy is a relic of a dead era and, as Seth teaches brilliantly, a mentality you cling to at great peril. Everyone with a pulse and a paycheck should be living We Are All Weird." "This book will resonate with anyone who wants to lead a tribe, be authentic, dance to the beat of their own music, and make a difference in the world. If your inner critic (the resistance) has been telling you that you are not enough, your work is not good enough, and who do you think you are to make a difference, then buy this book. Let your freak flag fly high!" "Seth has done it again. Open this book to almost any page. Read it, and change your thinking, your work, your life, or better express your art. Weird how he does this, isn’t it?"